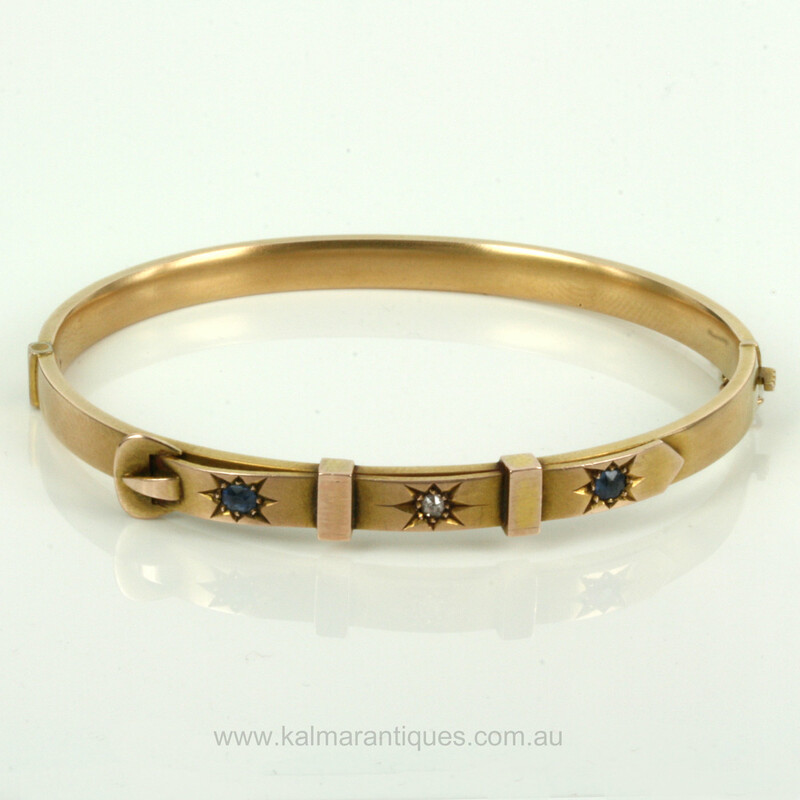 Antique hinged sapphire & diamond bangle. Product code: ES3311 Categories: Sold Items, Sold Jewellery. Here is an antique bangle from the early 1900’s that is so elegant and so easy to wear all the time and in absolutely perfect condtion. This antique bangle was made in 9ct rose gold and has such a wonderful warm colour to it and designed with a buckle motif which was popular in both the Victorian and Edwardian eras and looks so good combined with the sapphires and the diamond in the centre. On the top is a buckle design at one end and from this point to the end measures 47.7mm across. The buckle measures 7.8mm across and the two vertical bars measure 6.2mm across. Set with 2 sapphires that total 0.20 carats the diamond in the centre measures 0.05 carats and sparkles so nicely. Being oval and hinged allows this bangle to sit so nice and close to the wrist making it very easy to wear day or night. This antique bangle is over 100 years old yet still in superb condition and with the very elegant design allows it to be worn with other antique jewellery or on its own and always look so smart and refined. A truly beautiful antique sapphire and diamond bangle.